We have fully enclosed RV & Boat Storage Units with 12’ and 14’ doors for easy access. These large units are lighted and boast 18’ ceilings. 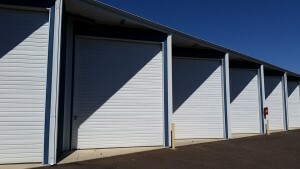 You can have your choice of 14’ x 32’ and 14’ x 40’. The covered RV & Boat spaces are secure with the perimeter being entirely fenced..
RV Storage Tips, Tricks, And Advice For All Your RV Storage Needs. Proper storage and maintenance of your RV will protect the financial investment you’ve made in your motorhome or travel trailer, extend the service life of your RV and increase its resale value when you decide to sell your RV. If you have kept your RV covered or garaged, be sure to note that in your ad; it’s a valuable selling point with buyers. Garaging your RV when it is not in use is the best way to protect its exterior from weather damage and maintain a high resale value. Over time, exposure to the elements can take a toll on your RV. Atmospheric ozone and UV light cause paint to fade and rubber and vinyl to dry out and deteriorate. Repeated exposure to rain, snow, ice and wind increase the potential for damage to your RV’s roof and body. 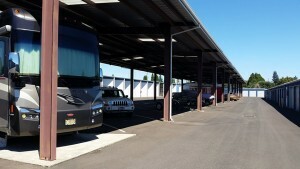 Unfortunately, few people have the garage space to handle RV storage. To protect their RVs from harsh weather, many owners in northern states and Canada rent indoor storage space during the winter months or house their RV in U-store facilities. When indoor storage is not an option, oversized metal carports and do-it-yourself canvas carports provide reasonable protection from the elements, particularly for vulnerable RV roofs. Keep your RV covered to protect it from the elements. Custom covers come in all shapes and colors and some even come with a zipper door so you can access the interior while covered! Wash your RV frequently and after trips to remove surface grime that can damage the exterior if allowed to build up. Never use harsh chemicals; use only mild soap and water or products specifically formulated for your RV’s exterior finish. There are drive through RV washing stations in almost every city if you don’t have the space. Wax the exterior of your RV using a quality wax formulated for your RV’s exterior finish. Follow the manufacturer’s instructions and exercise care around graphics. Waxing an RV is a big undertaking, but it is one of the most effective ways of protecting your RV from damaging dirt, grime and roadway chemicals. Scrub off black streaks as soon as you discover them. Wait too long, and you may not be able to remove them completely. Use an automotive black streak cleaner, testing graphics before application. Check for water damage regularly. Inspect all seals and caulking for signs of wear and repair promptly with approved RV sealant. Regularly inspect sealant at all cutouts. Any place where the manufacturer has cut into the RV’s body to create a window, attach a hose or vent an appliance is more vulnerable to water damage. Keep the roof of your RV free of leaves, debris, tree sap and branches. Inspect and thoroughly clean the roof several times a year, using cleaners compatible with the roof material. Whenever you clean your roof, carefully inspect all roof sealants for damage and reseal immediately with approved sealants.